Definition at line 112 of file v4math.cpp. 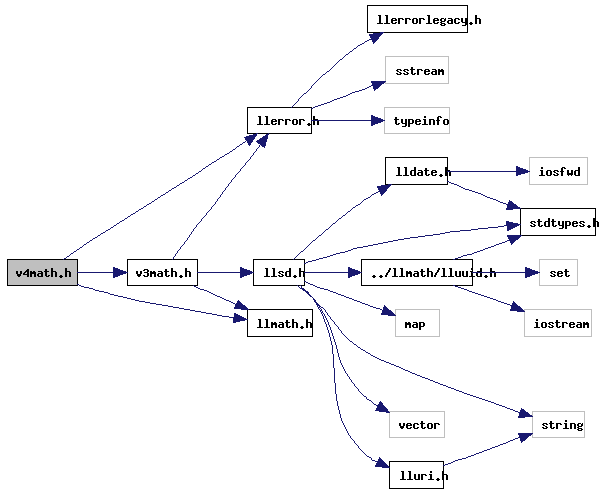 References a, angle, b, f, F_PI, and LLVector4::normVec(). Definition at line 125 of file v4math.cpp. References a, b, dot(), f, FALSE, LLVector4::normVec(), and TRUE. Definition at line 363 of file v4math.h. References a, b, and LLVector4::magVec(). Definition at line 369 of file v4math.h. References a, b, and LLVector4::magVecSquared(). Definition at line 375 of file v4math.h. References a, b, VW, VX, VY, and VZ. Definition at line 299 of file v4math.h. References a, VX, VY, and VZ. Definition at line 294 of file v4math.h. Definition at line 277 of file v4math.h. Definition at line 341 of file v4math.h. Definition at line 311 of file v4math.h. Definition at line 282 of file v4math.h. Definition at line 334 of file v4math.h. Definition at line 265 of file v4math.h. Definition at line 318 of file v4math.h. Definition at line 358 of file v4math.h. Definition at line 271 of file v4math.h. Definition at line 326 of file v4math.h. Definition at line 287 of file v4math.h. References a, t, VX, VY, and VZ. Definition at line 349 of file v4math.h. Definition at line 304 of file v4math.h. Definition at line 143 of file v4math.cpp. References LLVector3::mV, VX, VY, and VZ. Definition at line 138 of file v4math.cpp. References LLVector4::mV, VX, VY, and VZ. Definition at line 45 of file v4math.h.